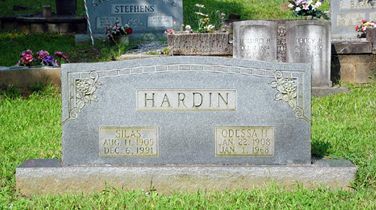 Silas Hardin, son of John Henry Hardin and Mary Melissa Spurill, husband of Odessa Howell and Curdie Susan Anne Abernathy. L. Odessa Howell, daughter of Richard Howell and Susan Alice Elliott, wife of Silas Hardin. Silas was the son of infamous Georgia moonshiner John Henry Hardin. His brother Paul made national headlines in 1932 when he murdered his wife and four children before turning the gun on himself. Silas Hardin, 86, of Green Street, Cartersville, died Friday, December 06, 1991. He was born August 11, 1905 in Cherokee County, a son of John Henry and Mary Malissa Spruill Hardin, a retired farmer and of the Primitive Baptist faith. He was preceded in death by his first wife, Odessa Howell Hardin. Surviving are his wife, Curdie Keys Hardin, Cartersville; daughters, Frances Garland, Lavane Sutton, both of Cartersville; son, Doug Hardin, Cartersville; stepchildren, Diane Couch, Wallace Keys and Doug Keys, all of Dallas; 14 grandchildren, 16 great-grandchildren, sisters Jewell Abernathy, Adairsville, Ruby Moore, Snellville; brother Joe Hardin, White. Funeral services were held Sunday, December 8, at 2 p.m., from the chapel of Owen Funeral Home with Elders Wayne Peters and Marty Smith officiating. Interment followed in Old Macedonia Cemetery. Pallbearers were Les Sutton, Allen Garland, Vance Keys, Tony Bryant, William Smith, Eldon Watts, Allen Juhan, Terry Mathison, Al Willingham and Raiford Cantrell. Mrs. Silas Hardin, 59, Route 4, Cartersville, died Monday night in a local hospital following a short illness. She is survived by her husband; two daughters, Mrs. Frances Garland, Adairsville, Route 3; Mrs. Lavane Sutton, Cartersville, Route 4; one son, Douglas Hardin, Cartersville, Route 4; three sisters, Mrs. B.T. Abernathy, and Mrs. John Abernathy, both of Cartersville; Mrs. E.R. Abernathy, Adairsville; one brother, Jesse Howell, White; eight grandchildren. Funeral services were held Wednesday afternoon at 1 o’clock at the Macedonia Baptist Church, with Elder Willie Howell and Elder Davis officiating. Interment was in the Old Macedonia Cemetery.